The Samsung Gear VR headset has been around for about four years, now, which is even longer than consumer VR has been in the IT mainstream. Samsung faced quite some trouble trying to sell these headsets during the initial phase of their release, but soon after, the Gear VR became very successful, and Samsung enjoys a prominent position in the VR scene today because of this device. The advantage of its success is that many creative and skilled developers have created VR content for the Gear VR. 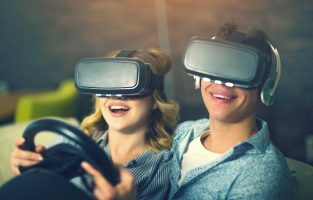 If you are at all familiar with the VR scene, then you probably know about the high-end VR hardware available, like the HTC Vive, the Sony PS VR, and the Oculus Rift. 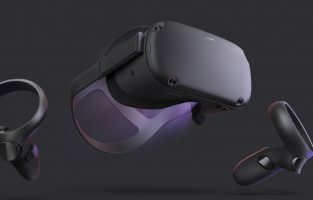 The Samsung Gear VR may not be able to provide you with the processor and graphics-hungry applications that can only run on a high-end VR headset tethered to a powerful PC, but the Gear VR will be enough for you to enjoy a wide variety of immersive, beautiful, and mind-blowing virtual worlds. There are over 1,000 VR experiences in the Oculus Store for you to try, not to mention the awesome VR apps and games that are not a part of the Store but are equally awesome. 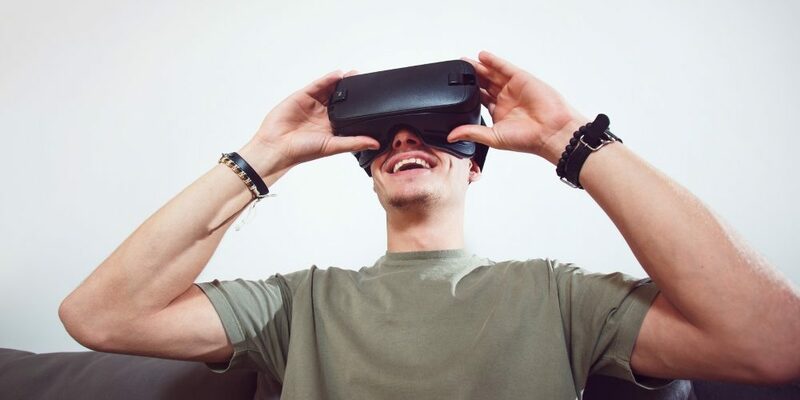 We have curated a list of the best VR applications to get you started on an adventurous and wonderful VR journey with your Gear VR headset. Samsung VR is a free resource with several amazing, immersive, and thrilling 360o videos. Samsung VR includes VR content ranging from anime to short films and documentaries, all separated into neat categories. This will make it easy for you to pick VR content that suits your mood. If you choose to take the Samsung VR for a spin, I would recommend you try Gone, a series created by the masterminds behind The Walking Dead TV series. This haunting story is a great introduction to the awesomeness of immersive technologies. Netflix’s VR app for the Samsung Gear VR has earned a place on a lot of best of-VR lists. However, the point of Netflix VR may not be immediately obvious, but don’t worry; it will be clear, once I’m done explaining. The first assumption you may make about the Netflix VR app is that the content gets ported into VR. It doesn’t. Netflix’s VR app doesn’t offer any content in VR, except for a Stranger Things experience. What is the point of a VR app, then? It’s simple: You get to feel like you’re at home when watching content on Netflix, even when you aren’t. You could be on a long train journey, or on an international flight, or there could be a party at your house and your living room could be crowded. As soon as you put on your headset, you instantly get transported to a mellow and warmly-lighted living room with a gigantic TV on which you can watch shows and movies. You may not find the idea interesting, but try it; I can guarantee that your opinion will change. The Netflix VR app is free to download, but it would be useless if you don’t already have a subscription. They Suspect Nothing was developed by a very skilled team of VR content developers, known as Coatsink. You will be seeing a few more entries on this list created by the same developer. They Suspect Nothing is a beautifully laid-out game which avoids the clichéd “AI will rule the future” concept. While it keeps some of the best parts of that thought, it also has a few new story elements that make this VR experience different from many others. You are placed in a futuristic world dominated by robots, and inhabited by humans who have made themselves scarce to avoid persecution. You are a human who has disguised himself in makeshift robotic gear. The robot leaders will give you a series of tests which you must pass to prove your Robotic lineage to the robots. The overall experience is very immersive, and the mini-games that will be presented to you as tests are also quite fun. They Suspect Nothing costs $7.99. The general assumption about VR is that it is a solitary experience. That’s not true, and the developers of this awesome social VR game are here to prove that to you. The result is so brilliant that you might start playing this game with your friends as a hobby. The friend with the VR headset on will be standing in front of a randomly selected bomb type, which will be covered with lots of wires and buttons. Your friends sitting with you will have access to a bomb disposal manual, but they can’t see what type of bomb you have in front of you. You will have to describe the bomb to them so that they can find the right tutorial, and then they will have to walk you through the disposal process. The game costs only $5.99, but what it offers in return is priceless. Nothing compares to the feeling of shooting zombies with a kickass shotgun, as their limbs disintegrate and their blood splashes everywhere. You will find yourself easily becoming addicted to the look-to-aim mechanism, which makes aiming your weapon a lot of fun. You will also find yourself feeling like a badass after a fight as you holster your virtual gun and look around to see all the dead zombies sprawled on the floor with their limbs scattered around. The overall graphics of the game are a bit cartoonish, but that won’t reduce the immersivity of the experience. Plus, the game delivers a few great, strategically-placed jump scares. Drop Dead costs €7.99 to download. 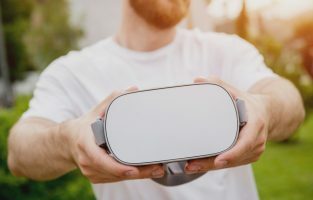 Virtual Virtual Reality was originally released by Google for its own VR platform, Google Daydream, but it was soon made available for the Gear VR and the Oculus Go. The game’s backstory is a bit weird; we are in a future era – or a parallel reality – ruled by AI robots, and the AI minds need human help with several odd jobs. The game’s cartoonish visuals and its bright and colorful theme make it one of the most-loved VR games in the industry. You can download Virtual Virtual Reality for just $9.99. If you enjoy making unique and weird paintings, Paint VR will be your new best friend. Most people who love to paint but can’t do it often don’t, because it is too tedious to manage all the equipment, and they find digital painting applications too hard to master. Paint VR is here to change that, with easy-to-use virtual paint brushes, colors, and canvas. All you have to do is unleash your creativity in a 3D environment. The Paint VR app costs just €1.49. Imagine paying so little for so much fun. Escape from Pennywise has adopted the same storytelling format and backstory; you’ll face the Dancing Clown, try to escape from him, and fail terribly, and be thoroughly scared in the process. The game’s premise is that you have been trapped in an old and scary building by Pennywise, and you have to choose a path to escape. Simple enough, right? Then why don’t you give it a shot, and see what all the fuss is about? Escape from Pennywise costs only $0.99. There is something about being a genetically-perfected, bald, super assassin that people love. After a huge success with its PC titles, Square Enix Montreal decided to create a turn-based mobile game out of the popular elements of the PC version. And the VR Hitman Go is even more awesome than the mobile edition ever was. In VR, Hitman Go appears as a detailed board game, with very beautifully-crafted figurines as the game’s pieces. Hitman Go challenges you to assess Agent 47’s environment, predict the position of your enemies based on their movements, and find the most efficient way possible to achieve all the objectives and complete the stage. Hitman Go: VR Edition costs €7.99, but the price is nothing compared to the rush that the game delivers. The Well was developed by Turtle Rock Studios, so you can be sure that it is a great VR game. The Well is a dungeon-crawling RPG whose beauty could only be enjoyed in virtual reality. You will need a controller to play this game, as there is intensive player interaction. The players see through the eyes of a champion selected by the Well’s creator. The Well has become the target of the Tesh, who seek to corrupt it, and destroy its balance. It will be your mission to seek powerful artifacts that will aid you in the fight against the Tesh, all while encountering different types of monsters in turn-based battles who seek to stop you from ruining Tesh’s plans. The beautiful graphics, the lighting, and the magical scenery will make you fall in love with this mesmerizing world over and over. The Well costs only $4.49. Do you love looking up at the starry night sky, and enjoy seeing all the celestial bodies that have captured the hearts and minds of today’s generation of astronomers? If you do, Star Chart will be a very special VR experience for you. It doesn’t matter if you live in an apartment or your own house; if you are anywhere near a polluted region – which is almost everywhere, today – you won’t be able to see the stars clearly. Star Chart provides you with a good view of the unpolluted night sky, as well as lets you jump into space and float around constellations in order to see them better. With Star Chart, you can also hold the stars you find intriguing in your hand to look closely at the details, as in some sci-fi movie. This app also includes the Mars Curiosity Rover and Apollo 11 Moon Landing experiences. The Star Chart VR app costs just $3.99. Republique was once a very successful and popular game on mobile platforms. Once all the episodes were completed, people stopped playing it; it’s now back in VR. The game featured an efficient touch control mechanism, and the stealth action gameplay was one of the best for Android and iOS smartphones at that time. Republique is an instant success in VR, as its gameplay and art are perfect for immersive technologies. You are a hidden observer somewhere in a facility watching through the security cameras. This facility is also the place where Hope – a teenage girl held captive by a totalitarian regime – is imprisoned. She will try to escape, and you will help her navigate through the building and avoid getting recaptured. The Republique VR version costs $9.99, but it’s definitely worth the money. There are two types of people in the world: People who love Minecraft, and people who haven’t tried it yet. It’s nearly impossible to hate a game that is basically a huge digital world made up of Lego pieces. If you are a fan of Minecraft, you should run to your nearest Samsung dealer, get a Gear VR headset, and download the Minecraft app for your headset. Trust me, you will not regret doing so. Minecraft for VR offers the popular survival and creative modes, in addition to multiplayer action, where you get to match your creativity and vision with other players from around the world. The immersion experience with this one is awesome when you play it in the classic first-person mode. However, this might be a bit too much for your eyes to adjust to; if that’s the case, you can always use windowed mode. The windowed mode, in VR, appears as a ‘Minecrafted’ lodge, with a giant TV; the game is running on the TV for you. With just $4.99, you can fuel your Minecraft fever practically anywhere, at any time. The future of immersive technologies isn’t just in gaming. As you can imagine, virtual reality can be used as a very powerful tool for storytelling, too. VR filmmaking is still in its early stages, as people are currently just experimenting with the technology. The Within VR app is where you will find some of the best filmmaking work yet done for VR. The VR app features some of the best music videos, immersive short films, and short documentaries in 360o video form available. Since the app is free to download, and comes with a lot of free VR content to explore, it should be on your VR apps list. Ocean Rift might be a bit too expensive for what it is, but nonetheless, the app clearly deserves a try, and will at least probably cheer you up. Ocean Rift’s premise is that you are underwater to see all the beautiful sea creatures there are. Even if you’ve done some scuba diving, you’ll still find novelty in this app. Ocean Rift, on the other hand, features 12 habitats through which you can swim, with sea creatures randomly generated around you. So, if you’re lucky, you could spot a dolphin, or a bale of turtles, or a few crabs, or a bloom of jellyfish, or, if your luck is too high, all of them, in a single swim! Ocean Rift costs $7.99, which may be a bit too much for the content, but you will really enjoy the unmatched immersion offered by this VR app. When talking about immersive technologies, horror is probably the best genre for VR, because it is all about immersion. You will learn this when you try Face Your Fears. It is disappointing that popular titles like Paranormal Activity and Resident Evil 7 aren’t developed for the Gear VR, but as you shriek and shout through Face Your Fears, you will realize that the Gear VR’s content library isn’t lightweight, either. Face your Fears has a number of levels that you can buy after downloading the app. However, the Stranger Things level comes free with your app download, and is by far the most thrilling experience in the list of horrifying content offered by Face Your Fears. Rangi is one of the best VR games available for the Gear VR. The first-person puzzler has a very beautiful and mystical feel, and will definitely keep you engaged for hours. Each level in Rangi is full of switches and movable objects; you will have to guide a light through the level by interacting with and replacing these switches and objects. The light, upon reaching the end, will open up a portal, which will take you to the next level. For just $3.99, you will enjoy a very immersive and beautifully-designed game which will make you get creative to find solutions. We all have a part of us that wants to teleport to the Star Wars galaxy and join in the action that Princess Leia and her small resistance experience on a daily basis. While Droid Repair Bay may not be a full-fledged action-packed RPG in that universe, it still is a part of it, and you will love this game if you are a fan of the galactic franchise. The app will put you in a spaceship’s droid repair center, and your task will be to repair the defective droid robots that come in. You will have to disassemble the droids, fix their problems from the inside, reassemble them, and send them off. As a free VR app, Droid Repair Bay will give you a small taste of what it feels like to live in that beloved universe. 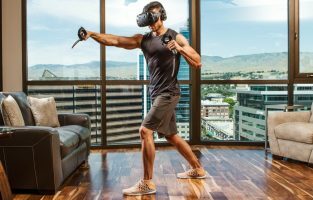 Smash Hit VR is a VR-ported version of a very popular and addictive mobile game that transitions you through large rooms; your mission is to destroy every intact piece of glass and glowing sculpture you can spot. The game is awesome in VR, and its beauty will keep you engaged for long hours of endless retries. The gameplay is pretty simple: As you automatically move forward, you have to shatter glass that is in your way. Eventually, glowing sculptures will show up; hitting these will give you extra balls with which to smash more glass. Smash Hit costs €2.99 in the Oculus Store. Have you watched the popular sci-fi movie Ender’s Game? If you have, and you love it, then you’ll definitely enjoy this game; if you haven’t, now might be a good time to check it out. You might not understand the point of playing turn-based games in virtual reality, but I dare you to try this one and not find your views changed! You observe a battleground through the dock of a spaceship as squadrons fly, hover, and shoot what seem to be plasma cannons at the enemy on your command. The neon color scheme of the game will be enough to addict you, not to mention the 30 campaign missions you can play once you buy the full version. Skylight costs nothing just to download and play a few missions, but you will have to pay $4.99 to unlock the whole game. Many of the VR experiences discussed in this article are arcade, or short, games. The Augmented Empire, however, will give you about 10 hours of awesome gameplay. It is not an arcade game; it has a serious story and a detailed backstory, so the Augmented Empire is a must-try if you are into VR gaming at all. Most of the time, you will be observing a grid board on which you can move your characters and fight turn-based battles. It might not be the most perfect game built for VR, but graphics that surround you when you put on your headset and launch this game are attractive. Augmented Empire costs only $7.99. Considering what the game includes, this is a great deal! Wherever advertised, the developers usually mention that this VR adventure game has been designed by the creators of Monument Valley – a popular and visually very attractive mobile puzzler. Land’s End, however, is not nearly as hard to play. In Monument Valley, you have to twist and turn objects in the environment to solve puzzles; Land’s End’s puzzles aren’t as complicated, but the visuals in the game are wonderful! The landscapes in Land’s End are for your eyes like deliciously sweet chocolates like Mars and Galaxy are for your taste buds. And all you have to pay to buy these delicious and delightful visuals is $4.99. Most of the games developed for the Gear VR are usually slow-paced and mellow, but that doesn’t mean that there aren’t any action-packed games available. End Space is the rival of awesome high-speed action VR games that other more powerful VR headsets boast about. End Space is all about destruction and survival: You will be piloting a spaceship in an intense dogfight; and the better you get at the game, the more adrenaline you’ll be able to experience. The action in this game will probably make you motion sick, at least in the beginning. The game costs $5.99, and it’s worth its weight in gold. Here is another action-packed VR game for the Gear VR! And there’s not just one, but two Anshar Wars games available for the Gear VR now. Anshar Wars is quite similar to End Space; you are a spaceship fighter pilot, and your job is to annihilate anything that shows up red in your HUD. The direction of the spaceship is controlled by your head’s movement, and you will have to use a Bluetooth controller for firing controls. If you don’t have a controller already, you could also use the headset’s trackpad to do the job, but it’s more fun with the controllers. The latest, Anshar Wars 2, costs $9.99. EVE Valkyrie is the high-speed action game of which higher-end VR headsets are so proud. EVE Gunjack is essentially a stripped-down version of EVE Valkyrie, made so that it could run smoothly in the Gear VR. Try this app out yourself, and you’ll see how attractive and addictive this game is. Gunjack costs $7.99 in the Oculus Store. Very few creators have ventured to explore the horror aspect of VR gaming, but those who have, have brought something original and truly scary. That’s probably because the immersion itself scares the player, so even when the jump scare isn’t that intense, experiencing it like it’s happening to you will get you pretty jumpy. Affected the game understands this concept. The gameplay is pretty much like that of Resident Evil 7; a torchlight partially lights your way around a haunted mansion, and randomly triggered jump scares scare the living hell out you. Affected: The Manor costs only $2.29. Darknet, as the name suggests, is about hacking. A stern voice instructs you how to hack network nodes. Your job is to spread different types of viruses across multiple network nodes, which you have to line up strategically to ensure that the greatest possible number of nodes and subnodes are affected, and the least number of firewalls and antiviruses catch your virus. Just an hour into the game, you will realize that the neon visuals of this game are just the bonus; the true entertainment is the game itself. The year is 2026, and the world’s population is decimated. Climate change is rapidly making the Earth less viable. Now, a little girl named Anaaya, and her AI-based companion named Melita, set out on a mission to find a new habitable planet to which to send humanity. The story of this beautifully choreographed 360o video experience is so captivating that it will end with tears in your eyes and a heartache you haven’t experienced in years. The experience costs just $1.99, but I would strongly recommend you try this one, if you want to treat yourself to the true power of VR. Dreadhalls is a scary first-person dungeon crawler; it will have you sneak through creepy and dark dungeons, picking locks and looking behind you, if you’re not too busy trying to keep your lamp from going out. Dreadhalls costs $4.99 in the Oculus Store, and will soon be available for the Oculus Rift, too. Please Don’t Touch Anything is a remastered version of a popular 2D puzzler, and it is a worthy entry on this list. The game is attractive and fun, but also is a bit short. However, even if you have played the 2D version of the game and know all the answers to all the puzzles, there are new puzzles added to the VR version that will make you stop and think. Also, the developers have sprinkled the game with Easter eggs, and references about the original 2D game, for you to spot and enjoy associated memories. PDTA has a price tag of only $8.99.